My story begins in Calgary on the 5th day of the 5th month of 1955, the day I entered the world. After my arrival, I was fortunate to grow up in a house filled with books. My mother passed on her love of reading to me; a perfect pastime during the long, cold winter months in Calgary. As I grew older I would sneak a plate full of butter tarts, and snuggle in my room for a good read while nibbling on my pilfered treats. I devoured everything in the family library from Louisa May Alcott to John Steinbeck, but I always enjoyed returning to my own collection of illustrated children’s books. The haunting illustrations in those books are permanently etched in my memory. In 1972 I was late for high school art class and came sliding into the classroom on my socks. The teacher watched me slide by and plop into my chair. With a raised eyebrow he said, “I saw that.” My great entrance made a big impression on a guy named Ron sitting at the back of the class. He caught my attention with his drawing of Snoopy, one of my favourite characters. We started dating and discovered a mutual interest in art and books. I couldn’t believe my luck when I saw Ron’s collection of books – another library to devour! After our wedding we moved to Victoria, BC where I settled down to a job with the provincial government while Ron worked towards a career in illustration. (He became a children’s book illustrator…hmmm, the man of my dreams!) I worked in the provincial Legislative buildings for a number of Cabinet Ministers and later in the Cultural Services Branch. A few highlights from those years include the Queen’s visit to the Legislative buildings, a visit by Prince Charles and Princess Diana (I spoke to Prince Charles!) and the day I carried a 4 million dollar cheque from one office to another. In 1994 I left my government career to work full time with Ron as his business and creative partner. It was also at that time, while Ron and I were still living in Victoria, that we read a newspaper article about a community of squatters living on Sombrio Beach, Vancouver Island. We were intrigued by the simple lifestyle of the squatters who lived without electricity, plumbing or telephones. Out of curiosity we traveled to Sombrio Beach and met with some of the residents, including a family with nine children all born in their rustic beach hut. We wondered how city children would react to a home without television, microwave ovens or computers. My experience at Sombrio Beach inspired me to write a story called Driftwood Cove. It’s an adventure, a mystery and ultimately a tale of friendship between campers from the city and squatters who live on a beach. I was very pleased when Ron, now an award winning illustrator, readily agreed to illustrate Driftwood Cove. As we discussed the images that were in my mind when I wrote the story, I was able to participate in the process of turning my words into pictures. This is an experience rarely shared by authors and illustrators of picture books. Driftwood Cove, published by Doubleday Canada in 1998, received the Sheila A. Egoff Children’s Literature Prize (1999) and a Canadian Children’s Book Centre Our Choice award. It was also short listed for the Ann Connor Brimer Writing Award, the Amelia Frances Howard-Gibbon Illustrators Award, and the Elizabeth Mrazik Cleaver Canadian Picture Book Award . In May, 1997, Ron and I relocated to the Annapolis Valley in Nova Scotia where we collaborated on our next picture book, Pumpkin People. Others inhabit an imaginary world known as The Ladies Tea & Garden Club. The members of this exclusive club meet weekly at The Rose Cottage Tea Room. I didn’t forget about your big birthday on May 5, but I just got so busy at work I didn’t get a chance to contact to you. I hope you had a great birthday. I remember the last time I contacted you on a big birthday and that was 10 years ago. Time certainly does fly. I see you have been quite busy these last 10 years. I love you sock dolls and remember you had quite a collection of unique toys when you were in Victoria. I have always loved sewing and crafting, and a few years ago I combined the two and took up quilting. I have been quilting about 8 years now and I love it. Although I don’t have enough time to do as much quilting as I like, I am really looking forward to retiring in 4 years, and then I can quilt full time. Anyway, say Hi to Ron for me and hopefully we can chat again soon. Wow…What a memory! Thanks so much for the birthday greetings. 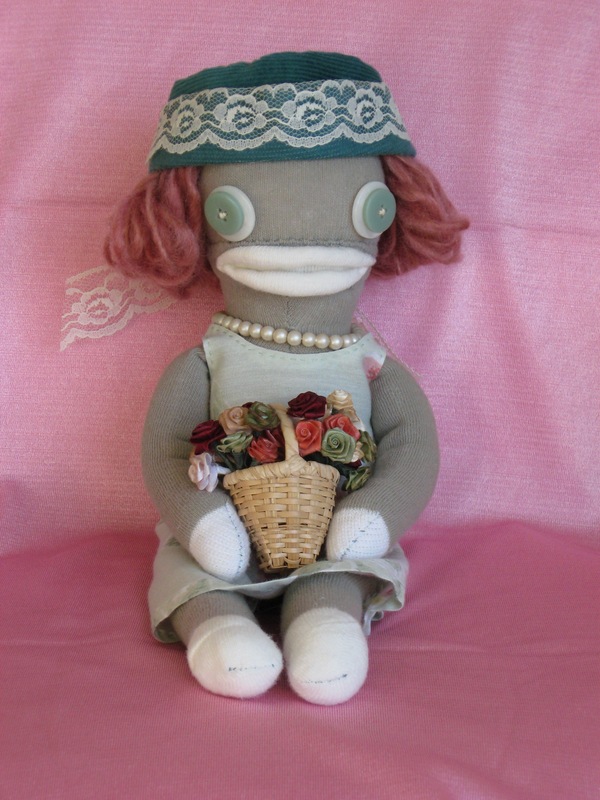 I’m having fun creating sock dolls. I think I’m the only person who stands in front of the socks in a store and laughs excitedly. I tried quilting, but then I discovered socks. You don’t have to be so precise with socks as you do with quilting. I would love to see photos of your quilts! It is so nice to hear from you…and Ron says “Hi”.